The regional qualifiers for the next Dota 2 major have been exciting, with over 100 matches played in the last 48 hours. The Kiev Major boasts a prize pool of $3 million, and so everybody and their grandmother has been competing to earn a spot, including one team that made a desperate move to somewhere in the southeast Asian region to do so. Prestige World Wide is an American team that moved to an unknown locale in southeast Asia to compete in the region’s Champion’s Cup. Normally, to earn a spot in a regional qualifier, and thus a chance to qualify for the major, a team would have to play in through open qualifiers. 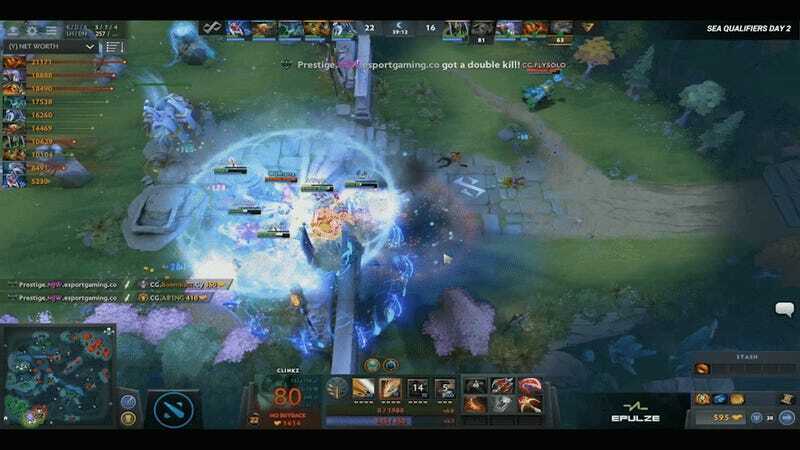 This year though, Valve opened up the Champion’s Cup, which let teams that won enough of its automated amateur tournaments (called Battle Cups) and had a high enough matchmaking rating play into the regionals through the Cup instead. Knowing this, Prestige moved to somewhere in the southeast Asian region, where they were the only team in the Southeast Asian Champion’s Cup, and therefore won by default. There was some irony in the fact that no team signed up for the North American Cup either—so Prestige could have saved in relocation fees—but the team made its move and got its spot. After two days in the grueling Southeast Asia regional qualifier gauntlet, Prestige World Wide finished 0-9. Some of the losses were long, drawn-out affairs, like its game against Execration which went to 51 minutes. Some were soul-crushingly fast, like a 20-minute surrender to Team Faceless, with the kills at 14 to 0 in favor of Faceless. In Prestige’s game against Clutch Gamers, “Armel” Paul Tabios dominated the match, closing out CG’s win with a literally game-breaking Ember Spirit play. This performance from a team that came through qualifiers isn’t out of the ordinary, besides a few exceptions like TNC’s run to last year’s International. Even within the Kiev qualifiers, several teams remain winless in other regions, including Alternate aTTaX, Wheel Whreck, Cavalry and Young Elite (at the time of writing). The hope for most teams is that making it into the regional qualifiers will be a stepping stone, a chance to compete against great teams and improve, to stand a better chance in a year. The Imperial, which now competes under the Cloud9 banner, and Elements Pro, are previous open qualifiers that now receive direct bids to regionals and are legitimate contenders to make it into the major. While Prestige may have paid a great deal for this learning opportunity, The International 7—and its associated qualifiers—is just a few short months away. Plenty of time to practice up, or maybe find another region that’s less difficult to play in through.